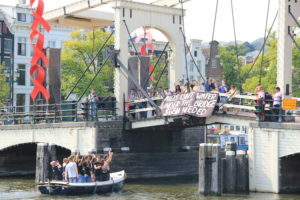 25 July 2018, Amsterdam – Activists at the International AIDS Conference took to the waters to sound the alarm that funding for the global HIV response is off track and that time is running out to reach the Sustainable Development Goal (SDG) of ending AIDS by 2030. 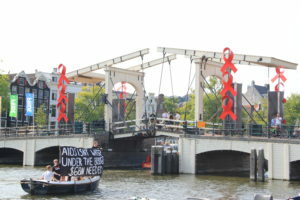 The action, led by STOPAIDS and the Health Global Access Project (Health GAP), saw campaigners steering a canal boat under the Amsterdam Skinny Bridge with a banner reminding the public that ‘AIDS Isn’t Water Under the Bridge’. 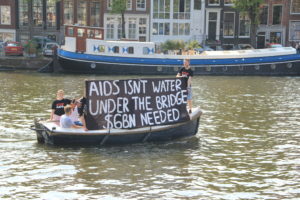 Campaigners are responding to the $6 billion annual funding gap that UNAIDS has identified in the global HIV response. At this critical moment in the HIV response there is evidence that donor governments are stepping back. A report recently published by UNAIDS and the Kaiser Family Foundation found that in 2017, 8 of 14 donors reduced funding for the global HIV response. Overall, donor government funding for HIV increased from 2016 to 2017, following two years of declines. However, this modest increase was largely due to a shift in timing of US disbursements rather than any new funding commitments, and is not expected to last. This alarming situation comes at a critical moment in the HIV response as UNAIDS cautions we are off track to meet the 2020 targets on prevention and AIDS related deaths. If we miss these targets we will not be on track to meeting the Sustainable Development Goal of ending AIDS by 2030. New HIV infections are declining too slowly with 1.8 million people newly acquiring HIV in 2017. New infections have declined by only 18% since 2011. In some regions, including Eastern Europe and Central Asia the rate of new infections is actually increasing. Nearly 1 million people died of AIDS related causes in 2017 compared to the target of reducing deaths to below 500 000 per year by 2020. Just over half of people living with HIV currently have access to treatment with 15 million people still waiting for access to treatment. AIDS is not over, but it can be. With just two years to reach the 2020 targets, the leading donors in the global HIV response must reverse current trends and increase political and financial commitment to achieve them. Activists from the two largest bilateral donors in the HIV response, the UK and the US, are particularly concerned. Asia Russell, Executive Director of Health GAP, said, ‘The global AIDS response is profoundly off track. This harsh reality is the consequence of major governments, in particular the US government, refusing to invest in life saving funding increases, exacerbating scandalous inequities in treatment and prevention access that are leaving millions of people waiting for life saving services. The effects of seven years of deadly US flat funding and European governments abdicating their donor commitments mean a grave risk that the AIDS response will fall irreversibly off track’. Mike Podmore, Director of STOPAIDS, said ‘The overall trend of declining donor funding for the global HIV response is extremely concerning and the UK government is no exception. Despite celebrated increases to multilateral institutions including the Global Fund, drastic cuts to the UK’s bilateral HIV programmes from £221m in 2009 to just £16m in 2016 has led to an overall decline in UK funding for the HIV response. As the second largest bilateral donor in the HIV response the UK must step up and reverse this funding trend if we are to meet the SDG target of ending AIDS by 2030. We were pleased that UK Minister Alistair Burt travelled to Amsterdam to attend the International AIDS Conference this week and hear first hand the scale of the challenges remaining in the global HIV response. We welcome the political and personal leadership he has demonstrated and look forward to working with him to get the global HIV response back on track’. STOPAIDS is a membership network of 70 organisations with a distinguished thirty year history of engagement on international development and HIV and AIDS. We were established in 1986 as a network which were previously called UK Consortium on AIDS and International Development and the Stop AIDS Campaign. We believe that the only way to fight HIV and AIDS is together. We bring UK civil society together, standing united, to advocate for UK leadership in the global response to HIV and AIDS. We directly engage at the global level through influencing key institutions including UNAIDS, the Global Fund to fight AIDS, Tuberculosis and Malaria and UNITAID. STOPAIDS also works with or sits on the board of strategic partners including peer networks and organisations that focus on global health, development, human rights and/or other key diseases or co-infections. Health GAP is an international advocacy organization dedicated to ensuring that all people living with HIV have access to affordable life sustaining medicines. Our team pairs pragmatic policy work with audacious grassroots action to win equitable access to treatment, care and prevention for people living with and affected by HIV worldwide. We are dedicated to eliminating barriers to universal access to affordable life sustaining medicines for people living with HIV/AIDS as key to a comprehensive strategy to confront and ultimately stop the AIDS pandemic. We believe that the human right to life and to health must prevail over the pharmaceutical industry’s excessive profits and expanding patent rights.